The Annual General Meeting will be held on 1st July at the clubhouse at 11am. Great news for Stanley Rangers! It's fifth time lucky for Stanley Rangers as the application to join the National Conference League has been approved at the NCL Annual General Meeting held last night at Leigh Miners, when 28 out of the 32 member clubs who were present at the meeting voted for Stanley. Chairman Wayne Grice who attended the meeting with Club Secretary Barbara Rawlinson, said that he was delighted with the result. He added "The hard work now starts for all concerned. All efforts are now on ensuring that the current playing staff get back into full training for the start of the season so we hit the field at full strength.". Club secretary Barbara Rawlinson is delighted Rangers have finally been accepted. "We're delighted that we've finally been voted in by the member clubs, the voting proved to be a landslide so we're really pleased after four years of trying." she said. Rangers will join Normanton Knights and Castleford Lock Lane in DivisionTwo of the NCL from next season and will also be eligible to compete in the Carnegie Challenge Cup. Tonight sees the meeting that will decide if Stanley Rangers will be included in the National Conference League from next season. The NCL management committee will be voting at the AGM which will take place at Leigh Miners Rangers' Twist Lane ground tonight - Monday June 25th. The committe have recommended Stanley Rangers for inclusion in the league from next season. The result of this vote will be shown here as soon as it becomes available. The U23s will be bringing home the Simone Franchini International Nines Cup after they won the final of the Nines at the weekend. As the Great Britain team the Under 23s took on Lyon, Corbeil and Italy A in Group A on Saturday. Then on Sunday they took on Lyon, London and Amis to be ranked top in the Nines, after beating Lyon 6-4. Richard Cattley was injured on Saturday with a 'popped' shoulder. The Under 8s will be playing against junior Wigan teams at the Wakefield Trinity Wildcats match against Wigan Warriors on July 1st. This is part of the events planned at Belle Vue on a day when Trinity supporters have been asked to wear their t-shirts for the Brennan Rooney Appeal. At half time, there will be a huge performance of children dancing with Daddy Cool in a record-breaking attempt at the Guinness World Record. Why not go along to support our team and enjoy a key Super League game? Stanley's Richard Cattley added to the 60-4 whitewash over Italy in the Second Test played last night in Moncelise. BARLA, who had won the tour opener 42-16 on Tuesday evening, made light of the blistering early-evening heat by easing to a 44-0 lead after 40 minutes with two tries each from Thornhill's Campbell, Phillips (Wigan St Cuthberts), Flynn (Thatto Heath) and Blackbrook's McGilvray’s openers plus tries by Drighlington prop Andy Brearley, second row Richard Cattley (Stanley Rangers) and Saddleworth scrum half Adam Kirwan. The BARLA squad now go into the International Nines tournament on Saturday and Sunday with two convincing wins under their belt. As the Under 11s squad reach the end of a very successful season they will be travelling across the Pennines to play against Wigan St Judes, Lancashire in the War of the Roses on Saturday 30th June, kick off 11.15am. A coach has been provided and will leave Stanley at 9.00am. After the game the boys will be enjoying a much-deserved trip to Blackpool. Presentation evening for all the players will be at the clubhouse on 28th July from 7.30pm at the clubhouse. The national No Smoking policy comes into force on July 1st. Please remember that the clubhouse will be no-smoking but that provision for smokers has already been made outside the clubhouse. The Under 10s squad are coming to the end of their very successful season. Training will finish on June 20th and restart on Monday 13th August. Signing on for the new season will be held at the clubhouse on Wed. 4th July from 6.30pm onwards. Presentation evening for all the players will be at the clubhouse this Thursday 21st June from 7pm. Richard Cattley will be flying out to Italy next week to take part in the short tour of Italy for the BARLA Under 23s. The squad, which will be managed by Wakefield ARL secretary Roger Fagge, fly to Monselice, about an hour from Venice on Tuesday and play their first test against an Italian national side that evening. The second test takes place on Thursday before the third match in the Simone Franchini competition nines trophy, which they won last year. Sides from Italy, South Africa and Spain will be taking part. The NCL management committee have recommended Stanley Rangers for inclusion in the league from next season - with members set to vote at the AGM later this month. Rangers' chairperson Barbara Rawlinson said: "The management committee have never recommended us for entry so this is one step further than we've been before. We're keeping our feet on the ground but it's great to be recommended and of course we hope the members vote for our inclusion later this month." Stanley have been refused admittance to the league the previous four seasons for numerous reasons including the size of their playing squad to the size of the car park. The AGM will take place at Leigh Miners Rangers' Twist Lane ground on Monday June 25th. No news has yet been received by the club about our application to the National Conference League. Once the result has been given to the committee, it will be put on the website News. Fifth time lucky for NCL application? Stanley Rangers are waiting to see if their fifth application will be successful to gain acceptance to the National Conference League (NCL). The club will find out by the end of the week whether they'll be playing National Conference rugby league after failing in their bid the last four seasons. The NCL Management is set to conclude its deliberations and make its recommendations to existing clubs, the go ahead to join the league or reject the application for a fifth consecutive time at the AGM in June. The club have had their submissions turned down for a variety of reasons previously, ranging from the size of their playing squad to the size of their car park but are hoping for better luck this time in the bid to join the league for the 2007/08 campaign alongside local rivals Castleford Lock Lane and Normanton Knights. The Under 10s Presentation Night is on Thursday 21st June starting at 6.15pm at the clubhouse. The Under 11s will be holding their presentation evening at the Clubhouse on July 28th at 7.30pm. Stanley Rangers' Richard Cattley has been named in the Under 23s squad who will be facing the Great Britain Students at Shaw Cross this Wednesday, May 23rd, as part of its preparations for the tour to Italy next month. The BARLA Under 23s will face Great Britain Students at Shaw Cross, Dewsbury, on Wednesday May 30th (6.30pm). The squad flies out to Italy on Tuesday June 19 for a one-week tour which will incorporate two Tests matches and a Nines tournament. Stanley Rangers U13s were just beaten 14-8 by Westgate Redoubt U13s in a closely-fought Wakefield Cup Final at Belle Vue Stadium. James Glover and Adam Megretton scored their tries and they were also unlucky to have two touchdowns disallowed The players should all be proud of themselves for a very successful season as semi-finalists in the Continuation Cup, runners up in the Wakefield Cup and joint second in the FAM Yorkshire League Division Three. They are taking a well earned break now and start training again in July [ Report ]. The winners of the CMS Yorkshire League Premier Division are Queens, who beat Myton Warriors 28-16 at Lock Lane. Stanley Rangers were fifth in the league, just missing the play-offs. In Division Three, Hunslet Warriors won the Alliance Cup Final, beating Heworth 18-4. Stanley's A team ended in 9th position. The Under 10s fixture against Shaw Cross on Wednesday 23rd May has been cancelled and both Under 10s teams are asked to attend training as usual. It is hoped to play the fixture at a later date. The Open Age team will have their presentation evening at the clubhouse on Friday 18th May after the showing of the Sky Super League game. The Under 13s team are in the Under 13s Wakefield Cup Final at Belle Vue stadium this Sunday, 20th May playing against Westgate Redoubt. The kick off is at 2pm. The Under 15s will also be playing in the U15s Wakefield Cup Final against Westgate Redoubt at Belle Vue with a 3.30pm kick off. The Under 15s are hoping to make it the third year in succession that they have won the Wakefield Cup. Both teams have had excellent seasons and reaching these Cup Finals is a tribute to the hard work and dedication of the players, coaches and families. Why not go along to Belle Vue on Sunday afternoon and give both our teams our support? Photos of the Stanley Rangers Under 11s in the Co-op Festival for junior rugby league on Sunday, 13th May, at 11am at Stanley Rangers ARLFC. The teams that took part were Wetherby Bulldogs and Crigglestone All Blacks. The games were played in true sporting manner with great skill and enthusiasm by all the teams. [ Photos ] Meanwhile both the Under 10s teams played at Belle Vue stadium before the Bradford Bulls game. Stanley Rangers Under 11s will be hosting matches as part of the Co-op Festival for junior rugby league this Sunday, 13th May, at 11am at Stanley Rangers ARLFC. The teams that will be taking part are Normanton, Wetherby and Crigglestone and everyone is welcome to come along and enjoy the rugby. United Co-operatives is sponsoring what is being billed as The World's Largest Rugby League Festival. As many as 7,000 children aged between seven and 11 will be playing rugby league at 34 venues across a large part of the Society's trading area on the first day of the festival - Sunday 18th September. The project has benefited from a Sportsmatch Award, part of the Government’s Grass Roots sports sponsorship scheme, and is being run in conjunction with the Rugby Football League. [ Co-op Festival ]. New dates for training and fixtures for both Under 10s teams can now be found on the Team page [ Under 10s ]. Hunslet Old Boys proved too strong for Stanley, beating the home side 42-12 [ Report ]. This win takes the Old Boys to top position in the Premier Division, subject to any successful objections by Hunslet Warriors over last week's 'walkover win' between the two clubs. Myton lie second, Hunslet Warriors third and Queens fourth, with Stanley in fifth position on goal difference. No matches will be played in the Yorkshire League this weekend because of the Millennium Stadium weekend at Cardiff. The Under 15s have been having a fantastic season as they have not only won their league - Division One of the Yorkshire Junior League - but are also in the Under 15s final of the Wakefield Cup on the 20th May, for the third consecutive year. Three of the team - Gareth Butcher, Billy Harris and Adam Milner - have been selected for the England U15s and a number of the boys - Gareth Butcher, Danny Ansell, Billy Harris, Adam Milner, Ross Padget, Liam Miller, George Griffin - have been selected for the Wakefield Service Area. In addition,Clayton Stott and Max Hobson have been selected for the Leeds Service Area. This is a great achievement and congratulations go to the team, their coach Simon Senkiw and all the helpers and parents of the team! The Open Age team have a tough game at the weekend when they take on second place Hunslet Old Boys at home. Hunslet are currently second in the league below Myton Warriors on points difference. Well done to the Under 16s who beat Castleford Panthers 20-14 to win the Yorkshire League Cup Final for their age group. The Under 16s have also been having a successful season, staying near the top of the Under 16s Premier Division and are currently lying second below West Hull and are in the final of the Wakefield Cup. After Stanley's loss against Hunslet Warriors last weekend, the first team are at home to Moorends, whilst the A team are playing host to Shaw Cross Sharks A.
Congratulations go to Richard Cattley who has been selected for the England U23s squad which will be undertaking an overseas tour later this year. Mattie Wildie, Stanley Rangers U16s player, who recently signed for the Wakefield Trinity Wildcats Academy has been chosen to play for England Under 16s. The Under 11s team in their latest team photo were featured in the League Talk column in the "Rugby Leaguer and League Express" this week. The Under 8s and Under 9s will be taking part in curtain raiser games on Easter Monday at the Wakefield Trinity Wildcats game against Bradford Bulls. The kick off time is to be confirmed but may be about 2pm. After a dry spell the Open Age team returned to their winning ways with a 36-12 win over Townville Tigers [ Report ]. This Saturday Stanley are away at Hunslet Warriors who are just above them in the league. The A team are at home to Upton. Congratulations go to the Under 13s who have secured a place in the final of the Wakefield Cup with a 20-16 win over Normanton Knights. The team are currently third in Division Three of the Under 13s league. Stanley Rangers were featured twice in the League Talk column in the "Rugby Leaguer and League Express" this week. Their headline story was "Have boots, will travel" and was about first team player Mark Robinson, who having joined the Royal Navy has been selected for a 24-man squad of Royal Navy players to tour Australia as part of the celebrations for the 10th anniversary of Royal Navy Rugby League. A full version of this interview can be found in the RFL website: [ RFL Community News ].The next piece was a fine photo of the Under 9s taken in the clubhouse in their new tracksuits. Stanley Rangers A team were winners over Castleford Panthers A on Saturday 24th March by 36-12. Photos of the game can be found on [ A team photos ]. This coming weekend the first team have a home fixture against second from bottom of the table Townville Tigers (kick off 2.30pm) whilst the A team take on Crofton Cougars A.
Congratulations and commiserations go to the Under 13s whose run in the Continuation Cup came to an end on Saturday with a defeat in the semi-final by rivals Dewsbury Celtic [ Report ]. This hard-working team have been having a successful streak in the after-Christmas period under coach Craig Lord - well done! Stanley were just beaten by two points in the Wakefield Cup by local rivals Kettlethorpe, the final score being 10-12. This weekend the Open Age team are scheduled to play away at Queens. The Under 8s will be playing before the Wakefield Trinity Wildcats v Leeds Rhinos game this Friday (16th March, ko 8pm). With the possiblity of a sell-out, why not go along early and support our stars of the future. A top of the table clash against rivals Hunslet Old Boys left Stanley with a 28-20 defeat. This keeps Stanley in third place in the Premier Division after playing 11 games. Stanley Wildcats U10s - a new team to the league - started in fine style with a wonderful display against Garforth running in nine tries and only conceding four to kick start their season off. Congratulations go to the coaches and parents of the Under 10s for all their hard work in setting up a second team. Disappointment for Stanley Rangers in a close-run match, losing to Myton Warriors who now move to the top position in the league. Stanley are now third in the Premier Division of the Yorkshire League, below Hunslet Old Boys and Myton. The Northern Rail National Youth Cup finals will be staged at Hunslet's South Leeds Stadium on Bank Holiday Monday, May 7th. The games, consisting of the U14s, U16s and U18s will begin at 2pm and close around 7pm. Our Under 16s are currently involved in the cup and have reached the quarter finals, playing against Bradford Dudley Hill on Sunday 25th February. Good luck boys! After the bad weather last weekend resulted in most matches being postponed it is business as usual this weekend for our teams. On the 24th February we will be having an appeal for the Yorkshire Air Ambulance. One of our players was recently taken to hospital by the Air Ambulance with a suspected neck injury. Thankfully he was not seriously injured but this service is literally a life-saver. Please help us to show our thanks to the service [ Events ]. Don't be lonesome tonight - put on your blue suede shoes and get ready to do the jailhouse rock at the clubhouse when Jim Santana presents his Elvis tribute. To enjoy some great music from the King, be at the clubhouse on the 3rd March when the evening starts at 7.30pm. The tickets are £5, including supper, and can be bought from Penny [ Events ]. Rangers Under 16s players Matthew Wildey and Kyle Trout have signed for the Wakefield Trinity Wildcats Academy - congratulations lads! This weekend Stanley are due to visit Queens, knowing that a win could see them rise up to second place in the Premier Division. Meanwhile, the A team are at home to division leaders Hunslet Warriors A team. The Open Age teams were both in cup action at the weekend but were unsuccessful in progressing to the next rounds. The Open Age team were beaten 28-18 by Upton in the second round of the Fred Marshall Senior Cup [ Report ] and the A team were edged out of the Wakefield and District Cup 18-13 by Sharlston Rovers A [ Report ]. The photos of the teams that took part in the curtain raiser games at the Wakefield Trinity Wildcats v Bradford Bulls match can now be viewed [ Photos ]. Congratulations to the Under 16s who have reached two cup finals this season. They beat Westgate 12-4 to get a place in the Wakefield District Cup and in a close-fought match they edged past West Hull 24-22 to take part in the Yorkshire League Cup final. Next weekend they continue in the BARLA National Youth Cup, taking on Castleford Lock Lane in Round 3. With a second place in the Under 16s Premier Division, behind West Hull, the Under 16s and their coaching staff are certainly working hard for their success. Well done to the Under 15s who are having a highly successful season and are currently top of the Under 15s Division One. The Under 13s are now second in the Under 13s Division Three, FAM Yorkshire Junior League. Stanley were knocked out of the BARLA National Cup with a 18-42 defeat by National Conference Division One side Ovenden [ Report ]. The glorious sunrises recently inspired the webmaster to rise early and capture the Lee Moor club under a fiery sky [ Photo ]. The Open Age team have a home game this weekend against Queens whilst the A team travel to Sherburn. Congratulations go to Jake Brown and Danny Pinder from the Under 16s who have signed for Huddersfield Giants. The kick off time for the curtain raiser games for our junior teams at the Bradford Bulls v Wakefield Trinity Wildcats pre-season friendly on January 28th is 1.45 to 2.45. Your support for our teams will be appreciated so why not go early to the game and enjoy our stars of the future! Stanley Rangers Open Age team resumed their winning ways with a 22-10 win over Kettlethorpe in the first round of the Fred Marshall Senior Cup [ Report ]. The Open Age A team also got through their first round match in the Alliance Cup with a 21-10 win over Oulton A. The Under 8s will begin their winter training for the New Year at the Ferry Lane pitch on Saturday mornings 10 to 11.30am from January 13th. The Wednesday evening sessions at Outwood Grange college will begin at the end of January. The Under 8s, 9s, 10s and 11s have been invited to take part in the curtain raiser at the Wakefield Trinity Wildcats v. Bradford Bulls match on the 28th January. Kick off time to be confirmed. With the return of David Solomona against his old club for the first time, there promises to be a big crowd and an exciting atmosphere for our junior teams to experience. Stanley suffered their first defeat of this season being beaten 40-12 by Upton [ Report ]. Stanley have been drawn away to Ovenden in the second round of the National Cup to be played on January 27th. Meanwhile, the season resumes after the Christmas break with Stanley travelling to Upton in a league fixture on January 6th. 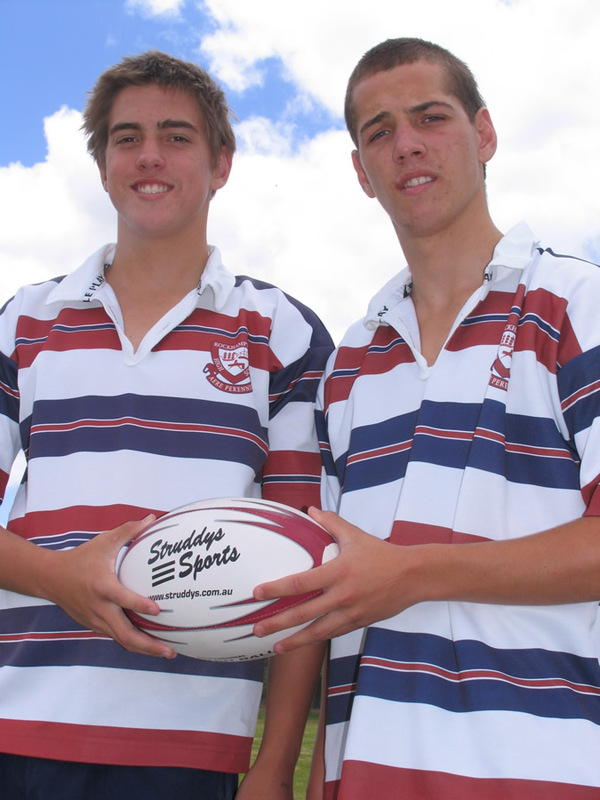 For the last three years there has been an exchange between Outwood Grange College and Rockhampton State High School. Whilst the Australian boys have been over in the UK they have also been playing for Stanley Rangers and attending Wakefield Trinity Wildcats. This year, James Dale and Curtis Taylor are in Wakefield. Curtis has been playing with the Under 17s but unfortunately James has a broken wrist and so he won't be playing until after the Christmas Break. Both boys are having a great time over here and want to thank the Wildcats who have really looked after them. The boys will be staying with two families each. Curtis Taylor has been staying with Ross Megretton and will also be staying with Shane Dixon ( 4 weeks apiece). James Dale has been hosted by Matt Wildie. He will also be staying with Danny Sampson. Rockhampton High School teacher, Mr. Robert Brodie who came over for the first exchange and keeps in touch with Stanley Rangers sent this photo of the boys [ Photo ]. Stanley Rangers are getting ready for their appearance in the Yorkshire Cup Final on Saturday 23rd December at the Chris Moyles Stadium, Post Office Road, Featherstone. Their opponents are Humbersiders East Hull Dragons. Stanley coach Gary Lord says that the club has a "one for all and all for one" attitude with everybody together. Although the rugby press has been putting Stanley as favourites for the final, Gary cautions that whilst not being over-confident "we're not putting ourselves down". Kick off is at 2pm and your support for our team will be appreciated. Congratulations go to the Under 16s who beat Westgate 12-4 in the semi-final of the Wakefield Cup and commiserations to the Under 17s who lost out to Normanton Knights in their semi final 6-48. A Mark Robinson hat-trick helped Stanley beat the Royal Navy 32-28 for a hard-earned victory in the first round of the BARLA National Cup. Going in to the interval with an18-12 deficit, Rangers turned their fortunes around [ Report and photos ]. Stanley travel to Ovenden in the next round. Stanley Rangers A progressed into the next round of the Wakefield Cup with a 28-22 win over Ryhill Hammers [ Report ]. They will be joined by Crofton who beat Eastmoor 40-10. Emma King - the Under 8s coach and junior secretary to the club - was presented with this national award by Her Royal Highness the Countess of Wessex in London last week. The RFL's Director of Development, Gary Tasker, said "We would like to congratulate both Tommy (Tompson) and Emma on their awards. Their work as volunteers at Rugby League's grassroots is tremendously valuable and they have each contributed so much to their local communities.."
Stanley Rangers face the Royal Navy team in the first round of the GMB National Cup this weekend, Saturday 16th. Both the Under 17s and the Under 16s teams feature in cup semi-finals this weekend. The Under 17s, now 6th in Division One, play Premier Division Normanton Knights in the semi-final of the Wakefield District Cup, whilst the Under 16s, currently second in the U16s Premier Division, take on Westgate, who are a division below them, in their Wakefield District Cup semi-final. Good luck to both teams! The Under 8s team, proudly wearing their new kit, were featured in both the League Weekly and the Rugby Leaguer and League Express this week. The team wish to thank everyone for their contributions, especially Gledhills Butchers and Peter Duffy. Coach Emma King received a Torch Trophy Trust award in recognition of her outstanding voluntary work for the rugby football league at the Army and Navy Club, 36 Pall Mall, London on Wednesday 29th November from the Countess of Wessex. Many congratulations to Emma for further recognition of her work for the club and the Stanley Rangers Under 8s team. Don't forget that if you need to check up on any past news for this season or any previous seasons, you can look at the [ Archive News ] section. Stanley Rangers beat Hunslet Old Boys 19-18 in the semi-final of the Yorkshire Cup with a drop goal by Danny Grice making the difference. In the other semi-final, East Hull Dragons beat Skirlaugh Bulls 23-0 to take the other place in the final. The game is to be played on Saturday 23rd December at the newly named Chris Moyles Stadium, Featherstone [ Report ]. Stanley have been drawn against Royal Navy at home in the first round of the BARLA National Cup to be played on December 16th. Other first round ties involving local teams include Queens v Keighley Albion, Queensbury v Drighlington and Upton v Townville. A hard-fought encounter against New Earswick All Blacks saw Stanley Rangers win 28-20 and secure themselves a place in the semi finals of the Halbro Yorkshire Cup. They will face Hunslet Old Boys away on Saturday 2nd December. The other semi final is East Hull Dragons v Skirlaugh Bulls. Club secretary, Barbara Rawlinson said in the Wakefield Express this week "everyone is getting a bit excited- we've been having a brilliant run in league and the cup this year. The final will be held over Christmas and while we' ld love to get there, we don't want to tempt fate. Let's get the semi over with first!" Winter training is now at the clubhouse on Mondays 6-7pm and on Thursdays at Outwood Grange College sports hall 7-8pm. With Stanley Rangers' latest win over league leaders Myton Warriors 20-8, they keep their unbeaten record in the Premier Division of the Yorkshire League - the only team to do so [ Report ]. They now lie second in the table , one point below Myton. This weekend - Saturday 18th November - Stanley go away to New Earswick All Blacks in the quarter finals of the 2006/7 Halbro Yorkshire Cup.New Earswick are currently fourth in the Premier Division of the Pennine League. With several big guns out of the competition - Sharlston Rovers and Queensbury - the cup is wide open. On Tuesday the 28th November, Wakefield Trinity Wildcats will be hosting a Wakefield/Stanley Rangers road show between 7pm and 9pm at the Stanley Clubhouse. The Wildcats will be sending over five first team players, who will be there for a Q & A session, followed by a merchandise sale, and a game of Question of Sport against 5 members from Stanley Rangers. The evening is open to all age groups and family and friends are more than welcome. This is a chance for the kids to meet the players, and get involved in some fun activities. The Stanley team for Question of Sport is open to any of the parents, coaching staff, or responsible kids, so if you feel that your knowledge of sport is enough to challenge the Wildcats team then put yourself forward to enter. You can contact Steve Parker from the Under 10s team for more information. This event promises to be a great night out, so please show your support! New sponsors for Under 10s - Wildcats on board! Stanley Rangers Under 10's would like to proudly announce the combined sponsorship deal they have secured from Wakefield Trinity Wildcats for the season 2006/2007. The Under 10's have been provided with a full 2006 Wakefield Trinity kit, and this will be used as a away fixture kit. This is the first time in over 100 years of professional RL that a professional team have sponsored, or in this case jointly sponsored, any amateur club, or team. We are also delighted to announce that the team's other joint sponsor is 5 Star Fitness from Castleford. This company is owned by Huddersfield Giant Ryan Hudson, Wakefield’s Wayne Pryce, and Featherstone Rovers Jamie Field. The reverse of the Shirts will be sponsored by Capricorn Connection of Ossett. Darren the owner is a very Keen Wakefield Supporter, and has recognised the importance of Local rugby partnerships, and has taken the chance to come on board with the Under 10's. Stanley Rangers beat Townville 34-16 at the weekend with a Danny Grice hat trick and four goals adding to the score [ Report ]. In Division Three, the A team beat North East Colliers 32-18. Under 8s coach Emma King received a pleasant surprise when she found out that she has been awarded a Torch Trophy Trust award in recognition of her outstanding voluntary work for the rugby football league. The ceremony will be held at the Army and Navy Club, 36 Pall Mall, London on Wednesday 29th November. Many congratulations to Emma for further recognition of her work for the club and the Stanley Rangers Under 8s team. Stanley Rangers made sure of a place in the quarter final of the Yorkshire Cup with a 32-12 win over Earlsheaton. They face New Earswick in the final eight play off to be played on November 18th [ Report ]. The Under 15s are through to the next round of the Wakefield and District Cup with a narrow one point win over local rivals Normanton. A Crossland kick took Stanley to a 19-18 victory. The Under 16s are also sure of a place in the Yorkshire League Cup with a first round win over Shaw Cross 26-22. The weekend results for the Open Age teams for Stanley Rangers produced a grand total of 120 points scored. The Open Age beat Stanningley Sharks 60-8 away, whilst the A team beat Garforth Tigers 62-10. Perhaps someone reading this can let me know if this is the highest score ever made by both teams in one weekend? Don't forget that on Sunday 29th October at 1pm there will be a Hallowe'en Party at the Clubhouse for all the family. Fancy dress is optional but would be preferred. There will be fun and games for all the children! The annual Bonfire Night will take place on the 3rd November starting at 6pm. There will be fireworks and food. Following the Grand Final last weekend, the Open Age resume their fixtures with an away game at Stanningley Sharks whilst the A team are at home to Garforth. Training sessions for the Under 10s have now changed. 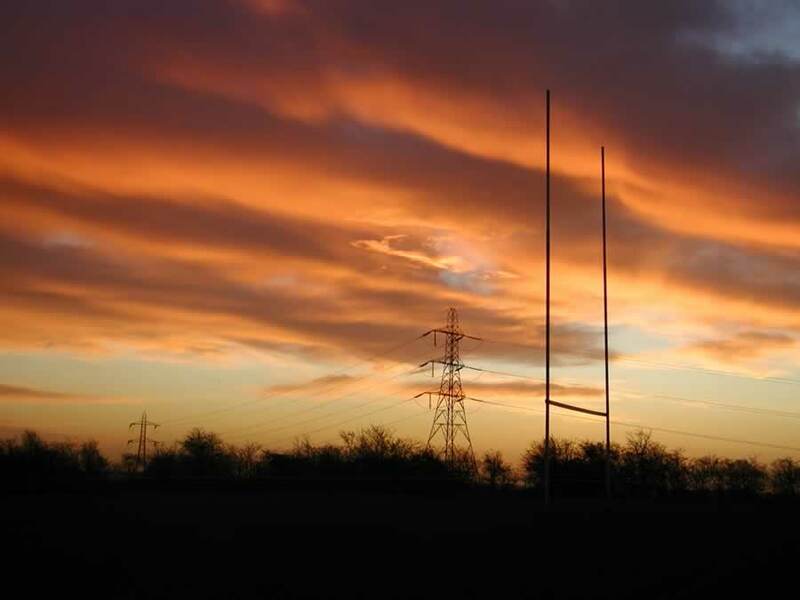 As from Monday the 30th of October due to the dark nights and state of the pitches, the U10s have managed to secure a slot at Sandal Rugby Union from 6.30pm to 8ish floodlit. This will enable the team to continue training outside until Christmas. The address is Sandal R.U.F.C. Milnthorpe Green Sandal Wakefield, WF2 7DY. Tel: 01924 250661 and the web site is [www.sandalrugby.co.uk ] (not far from the ASDA superstore, just off Standbridge Lane. Until further notice Wednesday training will be off unless indoor training can be found. On Wednesday 25th October, the U10s will be training with the Wakefield Trinity Wildcats at the Clubhouse, from 9.30am to 3.30pm. There will be no game this weekend for the Open Age team because of the Grand Final. Don't forget that you can watch the game between St. Helens and Hull FC in the comfort of the clubhouse. The match kicks off at 6pm. A 31-4 win over Ackworth booked a place for Stanley Rangers in the third round of the Yorkshire Cup. Tries from Rhodes, Cooper, Godfrey, Crawley and Walker gave Stanley a tie against either Earlsheaton and Hull or Reckitts. Daniel Sowerby, who plays in the Under 10s team, achieved third place in the Junior Male Sportsperson of the Year category in the Wakefield District Sports Awards. Daniel has played in both rugby codes last season (for Stanley Rangers and Sandal Ru) and also won the Most Outstanding Prospect at the Wakefield Trinity Wildcats Summer Camp this summer. The Open Age team play Ackworth Jaguars this Saturday (30th) in the 2nd round of the Yorkshire Cup. On Sunday 29th October at 1pm there will be a Hallowe'en Party at the Clubhouse for all the family. Fancy dress is optional but would be preferred. There will be fun and games for all the children! On Friday the 1st December, there will be a Ladies only Night at the Clubhouse. Tickets are price £6 and for more information please contact Penny. The club is very pleased to announce that we have been shortlisted in two categories for the Wakefield District Sports Awards. In the Junior Male Sportsperson of the Year is Daniel Sowerby. The Wakefield Express says: "Stanley Rangers Rugby League starlet Daniel turned his hand to Rugby Union with Sandal last season - and marked his code debut with 51 tries for the season. He played a key role in Sandal winning six national and regional festivals. The nine-year-old continued playing with Rangers and racked up 38 tries in only 19 games bringing his U8s and U9s total to 149 tries in just 12 months. He has also recently picked up the gloves to keep goal for Stanley United U9s." In the Junior Team Performance of the Year, the Under 9s of the 2005-6 season have also been shortlisted. "Stanley Rangers U9s Rugby League Team. Stanley Rangers U9s are the only unbeaten team in the top division in their age group having beaten the best of the rest from Leeds, Dewsbury and Castleford." Junior players from Stanley Rangers are also among the Outwood Grange College Year 10 rugby league team who have been shortlisted for the category School Team of the Year. The presentation for the Awards will be made next Monday evening at Castleford Civic Centre and John Kear, successful Wakefield Trinity Wildcats coach, will make the presentations. Good Luck from the club to Daniel and the Under 9s team! The Under 11s fixture against Crigglestone will now be played on Tuesday 19th September, kick off 6.15pm. The new training nights for the Under 11s will be Monday and Friday evenings from 6-7pm at the Ferry Lane pitch. On Saturday 16th September, the Open Age team play Embassy (H); the Under13s are at home to East Leeds (10.30 ko on school field); the Under 11s are home to Crigglestone (11.30 ko at Ferry Lane pitch) and the Under 10s are at home to Shaw Cross (10.30 ko at Ferry Lane pitch). On Sunday 17th September, the season begins for the Under 17s at home to Kippax; the Under 16s are away to East Leeds; the Under 15s at home to East Leeds (ko 10.30am on top pitch); the Under 9s are at home to Dudley Hill (Ferry Lane pitch) and the Under 8s are in the co-op Festival at Crigglestone. The Open Age team kicked off their 2006-7 season with a resounding win over Cutsyke 48-6. This weekend they play Embassy at home in the first round of the Yorkshire County Cup. The Under 10s will now be training on a Monday evening at the Ferry Lane pitches starting at 6.30pm, until the evenings get too dark. 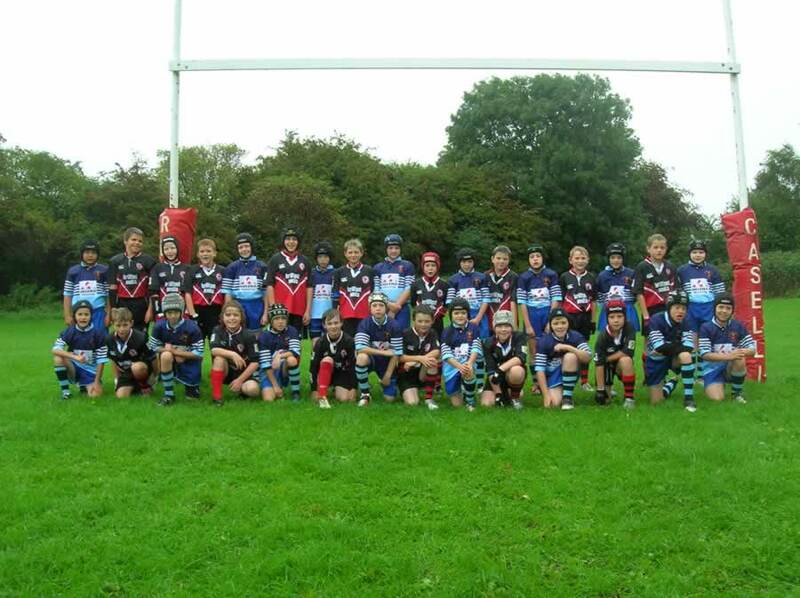 The friendly match between Stanley Rangers' Under 10s and Blackbrook ARLFC took place in torrential rain on Saturday 2nd September. Despite the awful weather both teams were fantastic and the final score was a 20-10 win for Stanley. The Under 10s hope to visit Blackbrook for the return fixture in May next year [ Photo ]. The new season begins this weekend with the Open Age A team meeting Heworth at home on Saturday 2nd September. The first fixture for the Open Age team against Moorends has been postponed and their first game will be at home on the 9th September against Cutsyke. Other weekend fixtures include: U8s away at New Earswick in a tournament on the 2nd September; U10s will play host to Blackbrook Royals ARLFC from Saint Helens on the 2nd, k.o. probably 11am; U11s and U13s away at New Earswick in a tournament on the 2nd September. The new season's fixtures for each team will be added to the teams' webpages as soon as they become available. Stanley Rangers have been drawn against East Yorkshire side Embassy in a home fixture in the opening round of the Yorkshire Cup. Other ties include Sharlston Rovers at home to Calder Valley; Normanton Knights away at Siddal; Westgate Redoubt away at Birkenshaw and Sharlston A at home to Halifax Irish. Fixtures to be played on September 16th. On Sunday 10th September the Stanley Rangers Fun Run will be held, starting at 11am from the Clubhouse. Get your running shoes out and have a go! [ Events ]. Under 8s coach Emma King featured in the Yorkshire Evening Post (31.08.06) on the front page and also in a feature about achieving the RFL National Youth Volunteer of the Year. Photos of Emma training the Under 8s were on both the front page and inside and she was even mentioned in the editorial. She was presented with her award by Richard Lewis, chairman of th RFL at half time in the Challenge Cup at Twickenham. She enjoyed a three course meal and watched the game from a hospitality box. Congratulations go to Emma from everyone at the club, the Under 8s friends and family. The Open Age team began its pre-season training on the 11th July. Training will be on a Tuesday and Thursday evenings at 6.45pm at the clubhouse. Old and new players are welcome. Gary Lord, ex Leeds and Castleford, is the new Stanley Rangers Open Age team coach for the 2006/7 season. The friendly game against Blackbrook Royals ARLFC from Saint Helens will be on the 2nd September.